Introduction: Botanical plant growth regulator used to increase yields, blossom production and desirable growth effects. Another name: Zeatin, (E)-Zeatin, Zeatine, etc. H315 (100%): Causes skin irritation. H319 (100%): Causes serious eye irritation. Acute toxicity: 1) Acute oral LD50 for rat: >5000 a.i.mg/kg. 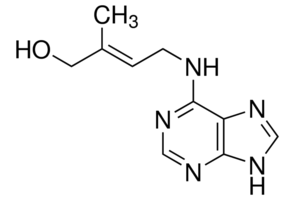 2) Acute dermal LD50 for rat: >2000 a.i.mg/kg. Effect on fish: low toxicity to fish, acute 96 hour LC50 for Rainbow trout is >1000 a.i.mg/L. Effect on aquatic invertebrates: low toxicity to aquatic invertebrates, acute 48 hour EC50 for Daphnia magna is >1000 a.i.mg/L. Usage: Zeatin is a plant hormone derived from the purine adenine. It is a member of the plant growth hormone family known as cytokinins. Zeatin was first discovered in immature corn kernels from the genus Zea. It promotes growth of lateral buds and stimulates cell division to produce bushier plants if sprayed on meristems. 1. Promotes callus initiation when combined with auxin, concentration 1 ppm. 2. Promotes fruit set. Zeatin 100 ppm + GA3 500 ppm + NAA 20 ppm, sprayed at 10th, 25th, 40th day after blossom. 3. Retards yellowing for vegetables, 20 ppm, sprayed. 4. Causes auxiliary stems to grow and flower. It can also be applied to stimulate seed germination and seedling growth.